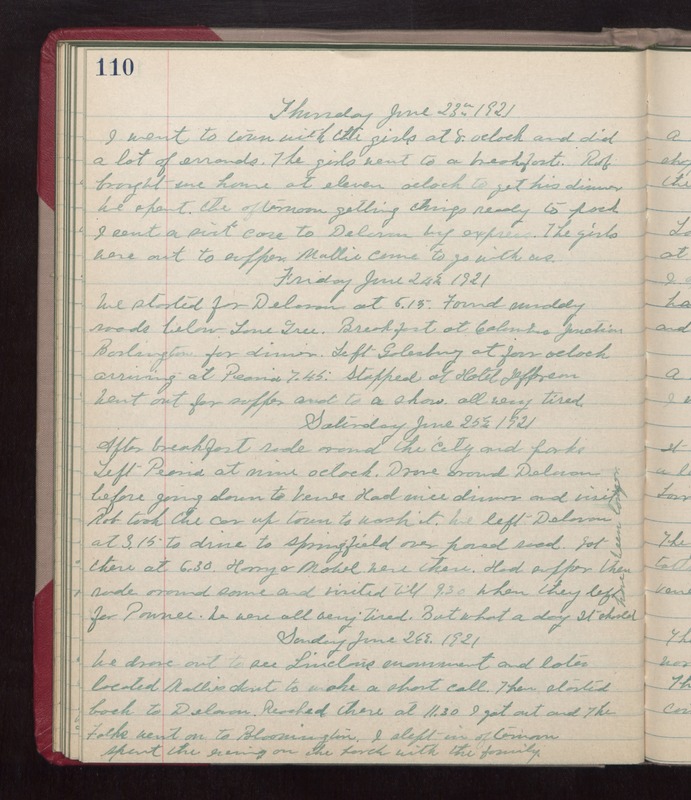 Thursday June 23rd 1921 I went to town with the girls at 8 oclock and did a lot of errands. The girls went to a breakfast. Rob brought me home at eleven oclock to get his dinner. We spent the afternoon getting things ready to pack. I sent a suit case to Delavan by express. The girls were out to supper. Mollie came to go with us. Friday June 24th 1921 We started for Delavan at 5.15. Found muddy roads below Lone Tree. Breakfast at Columbus Junction. Burlington for dinner. Left Galesburg at four oclock arriving at Peoria 7.45. Stopped at Hotel Jefferson. went out for supper and to a show all very tired. Saturday June 25th 1921 After breakfast rode around the city and parks. Left Peoria at nine oclock. Drove around Delavan before going down to Venes. Had nice dinner and visit. Rob took the car up town to wash it. We left Delavan at 3.15 to drive to Springfield over paved road. Got there at 6.30. Harry & Mabel were there. Had supper them rode around some and visited till 9.30 when they left for Pawnee. We were all very tired. But what a day. It should have been longer. Sunday June 26th 1921 We drove out to see Lincolns monument and later located Mollies Aunt to make a short call. They started back to Delavan. Reached there at 11.30. I got out and the folks went on to Bloomington. I slept in afternoon. Spent the evening on the porch with the family.